Lincoln models 3675 and 3677 fuel caddies are designed for the safe transfer and storage of fuel before, during and after repairs which require the removal of a vehicle’s fuel tank. Both offer features and components specially designed and adapted for use with unleaded gasoline, kerosene and diesel fuels. The use of Lincoln fuel caddies will help to ensure the clean, safe and convenient transfer and storage of fuel around a shop. 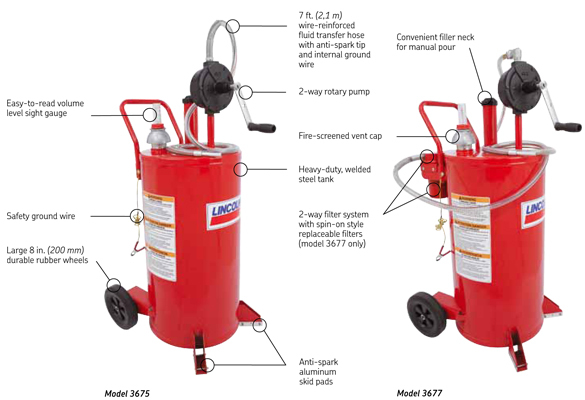 Both models combine a portable 25 gallon (95 liter) steel tank and 2-way rotary pump to extract, store and dispense fuel prior to, during and after repairs. Model 3677 includes a 2-way filter system that automatically directs the fuel through separate filters depending on the direction of flow. User’s Manual (English, French, Spanish, German). Large capacity 25 gallon (95 liter)heavy-duty welded steel tank. High volume 2-way rotary pump dispenses or extracts fuel at a rate of one gallon (4 liter) per 20 revolutions. Large 8 in. (200 mm) diameter rubber wheels. Easy-to-read sight gauge clearly indicates fuel volume in tank. Screened filler neck allows fuel to be poured in manually. Fire-screened vent cap prevents tank pressurization. Includes ground wire and anti-spark skid pads. Automatic 2-way filter system uses two common spin-on filters to remove particulates while dispensing or extracting fuel (model 3677 only).